The Majestigrid indoor-outdoor carpet mats and runners are the ultimate combination of the tough Majestigrid carpeting with vinyl backing. This has created an extra-durable vinyl-backed mat It is made of tough deneir polypropylene fiber for trapping grime from shoes. Pile thickness is 3/8" (high point) to 3/16" (low point). Vinyl backed with 1" edge all around. Designed for the heaviest traffic areas, both indoors and out,and traps more water and dries faster than any other carpet fiber. Stop dirt at the door. 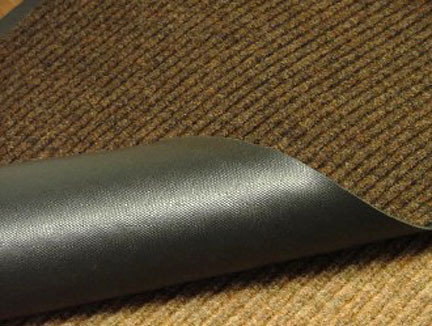 All mats and runners have vinyl edges. For prices and shipping charges on runners, contact U.S. Bank Supply, or if you desire a custom size. Phone: 805-218-6106 , or e-mail at orders@usbanksupply.com. All carpets are made to order and take about 10 days to ship. The Majestigrid indoor-outdoor carpet mats and runners are the ultimate combination of the tough Majestigrid carpeting with vinyl backing. This has created an extra-durable vinyl-backed mat It is made of tough deneir polypropylene fiber for trapping grime from shoes.